« All the News That’s Fit to ME! Thank you for this. I find myself increasingly concerned by what I think of as the speed-up of academic expectations, that pressures people at all stages. Instead of seeing teaching and scholarship as really joint obligations, most people think of their scholarship as their primary work. I don’t entirely blame them, because at least where I am, that’s the key to all promotions. But we expect people to do too much too fast… Many scholars in the generation that trained me didn’t write a book every 4 years, or one or two articles a year. They let things take their time. There were some advantages to a more “gentlemanly” world. Humanists have, I think, paid too much attention to productivity models from the sciences. We are not very kind — to ourselves, or to others. I haven’t seen this happening because most of the people I know (including me and including junior faculty) are happy, or pretend to be, to have a job in this miserable economy. Is it indeed a trend? Maybe CHE should write about it. As to Susan’s point: Humanists didn’t pay attention to those productivity models until we had to, I don’t think. Want a t-t line? Want a budget for next year? What are your metrics? say the scientists who run things. I know that the change came when forced, but I am wondering how the increasing diversity of the profession contributes to it. Is this a way of keeping women and those less privileged in their places? I know that the coincidence between the change in the makeup of the profession and the change in expectations is not necessarily causal, but I don’t think it’s entirely accidental. I fantasize about quitting ALL the time. I think I might be happier at a school that had a smaller teaching load, but I’m not sure I could handle the research pressure. As it is, I have minimal research pressure, but I am being productive (have two articles out for consideration now, a conference coming up, and a book in mind, even though I don’t have to write a book for tenure). But I am sick of teaching because I only get to teach gen ed classes, while my specialty comes up a mere once every two years. If I could teach Shakespeare every semester — or even every year — at least I’d have something to look forward to. Instead, I’m teaching stuff that anyone could teach. I know I’m lucky to have a job in this market, but it’s not a job I’d wish on most people. Do I really want to keep it forever? I’m still struggling with writing about my own experience quitting academia. Maybe I’ll go ahead and get to it. It’s not just academics in the USA that are getting fed up. In Australia, there are fewer and fewer tenured jobs, most of the academic staff are casually employed and the people earning the most money are the bureaucrats who shuffle papers all day. It’s completely disheartening. I wonder how much you’re noticing at QTU has to do with the (relatively) high cost of living on the east coast compared with the (relatively) low wages for entry-level positions on the tenure track (even at research universities, and no matter what the location). So I am not at all disagreeing with what you notice, but rather adding another layer of structural consideration to it. Perhaps the problems aren’t only with the cultural expectations of the twentieth-century academy (the ramping up of publication expectations, the insistence on “metrics” to prove “excellence without money,” the emphasis on customer satisfaction surveys to prove teaching quality) but also with the economic expectations… that a new assistant professor (often with student loan debt) can have a decent life in a place where houses (or even condos) minimally cost upwards of $250K, and where one has no choice of location so would likely not be near to a support network that could help with things like childcare, eldercare, or even just things like house-sitting or pet-sitting or other mundane things that one must ultimately pay for if one doesn’t live near extended family. Add to that commuting costs if one moves away from one’s partner, or the costs incurred when a partner can’t get a job in your institution’s location…. All of these things hit those “younger” in the profession much harder than they hit those of us who’ve been around longer. So unless you’ve got an inheritance… yeah, you might think about leaving the profession altogether. Honestly: I am so, so lucky I ended up where I did, and not in Boston, where I went to grad school. My grad school BFF got a job at a college there, and she makes maybe 10K more a year than I do. That comes nowhere near to making up for the cost of living difference. If I had gotten her job and not mine? I’d probably have had to quit. You may be onto something, Dr. C. Certainly the combination of the sky-high cost of living in the Washington metropolitan area and frozen/cut salaries has added to the stresses of younger faculty at QTU in recent years. I would be interested to hear about rates of attrition among tenure-track assistant profs nationally. I wonder if anybody tracks such things. MLA? Thanks to everyone for the thoughtful, honest comments and all the sharing of this post over the last few days. I’ve been blogging for six and a half years, and I’ve never seen anything even remotely close to the traffic this post has gotten — close to 2500 views since I put it up Saturday evening, on a holiday weekend. It seems to have struck a chord with a lot of folks, which is gratifying, but it also makes me sad. There is a lot of misery out there. A blog post won’t relieve the misery or change the conditions that produce it, but, well, talking about it beats hell out of not talking about it, so I’m glad this little post found its way out into the world this Labor Day weekend. Thanks for reading, everybody. 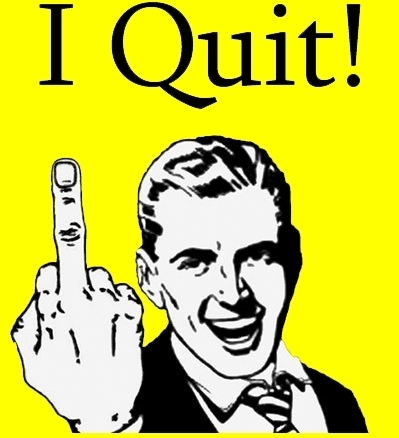 I quit my tenure-track job in July, 1-2 years before I would have gone up. The decision to leave happened gradually and then all at once, and I have absolutely no regrets. In fact, one of the reasons it is so easy is because I can’t remember the reasons to stay. (Certainly it wasn’t the teaching anymore. The research? If I cared to do it (I don’t) I could be an independent scholar, but I do miss the feeling of caring about my research.) I’d say “surely someone who wants to be there can have the job,” but since they haven’t replaced the other lines (30% since I started), that would be a bit disingenuous. One of the most telling things, to me, is the fact that no one at the institution ever asked me why. And I know, for a fact, that they have to submit the reasons why to the provost. My letter just said, I’m leaving, here are the dates and here are the things I’m doing before then. I expected someone along the way to ask why (#1 salary stagnation and #2 “pursing opportunities elsewhere”) and no one did. This reflects both my department’s approach to the world but also just aninstitutional inability to acknowledge the fact that working conditions are so very bad, at a flagship R1 (2/2, baby), that people on the tenure track and tenured are just leaving. The things I care about have changed since I was in my early 20s. I was very successful, got a very good job, and then realized that my work and my priorities didn’t match at all. My partner turned down a tenure track job at a good school in a crappy place, and we’re staying here because it is a wonderful place to live with lots of jobs in industries where former professors get hired. I have no intention of ever going back, and I appreciate how many things I did do at my job that I can list on my resume. It will be rough, it will be hard, but at least it won’t be there. This post articulates everything I’ve been contemplating the past 6 months. Thank you. I am currently 2 years away from going up, but am increasingly feeling that tenure is even further away from my life priorities. Another (anecdotal) data point to support Dr. C’s theory: wage stagnation and cost of living are definitely major subjects of discontent/discussion among my tenure-track colleagues (at a large suburban R2 in a high-cost-of-living, traffic choked — so commutes to semi-affordable housing are even worse than they sound — metropolitan area). (Said colleagues just wince when I point out that the great majority of the 30% of full-time faculty who are contingent make even less than the entry-level wage for a tenure-track assistant professor, which is, indeed, barely adequate to support a single person in modest comfort in our area. And I wince when I think about what part-time contingent faculty/adjuncts are making, especially after cutbacks in adjunct loads designed to guarantee that the university won’t be required to provide health insurance under the Affordable Care Act). There’s considerable expressed concern at administrative levels (both departmental and university) about the competitiveness of TT salaries, with the argument made that non-competitive salaries could hurt recruitment/retention of TT faculty. I’m not sure whether or to what extent the size of offers are actually affecting recruitment; hires are definitely being completed more often than not, though whether with the first-choice or the third-choice candidate (who would probably, in the current marekt, be equally good) I’m not sure. So far the younger colleagues who have actually left have doe so for other TT academic jobs in more affordable climes (often those already occupied by significant others). So there doesn’t seem to be an exodus from the academy; however, I suspect that some of the replacement TT jobs could be described as in some way “less desirable” — e.g. higher teaching loads. So, not quite a “take this job and shove it” pattern, but perhaps what might be described as a considered retreat to a more manageable overall lifestyle of the sort that Dr. C describes. We also seem to have a lot of takers among senior TT faculty for fairly generous retirement incentives. I don’t get the sense that most of the people departing are fed up so much as ready to move on to the next stage of life (and, in some cases, to a new place — which is one of the potential upsides of paying down a mortgage in an expensive metropolitan area for a few decades; sometimes, you can afford much more property somewhere else). Some, also, seem to be hoping to open up TT lines for others (and, so far, the department is being allowed replacement hires. If someone retired and wasn’t replaced, I suspect some folks who are considering retirement would reconsider, and perhaps keep reconsidering until carried out feet first). Thanks for this post, especially for sharing about Keguro. I was finishing up my grad work at QTU at around the same time I think he started as an assistant prof. I considered the new assistant profs the lucky ones, but that may have been largely because there was (or I perceived there to be) a wall between “us” graduate students and lecturers and “them” — all you folks on the tenure track. I wish I had known Keguro better — and those other assistant profs that quit and the other lecturers that walked away, with or without their PhDs. I think we might have had things to talk about. I quit because I chose to, despite pressure to stick it out and try “just one more year” on the market. Quitting wasn’t a hard decision for me, once I’d had a good look around post dissertation distraction, but it was a very lonely one. I think isolation is part of the problem, particularly how difficult it is for people at different levels within the profession to openly and honestly talk about the situation. In answer to the questions you posed, anything you can do to open up lines of communication would help.